Weather is said to be very unpredictable and there is nothing worse than looking out of your window in the morning and dressing for a bright sunny day then getting drenched on your way to lunch. However, you have the chance of saving yourself from some discomfort by looking ahead at your day. This is possible by using mobile apps which forecasts weather. With the help of weather apps, there is no need to leave the comfort of your house in order to know how warm or cold it is outside. It is said that when you receive hourly or weekly forecasts and get alerts for any kind of change in the weather through notifications then there is no need for you to worry about sudden change in the weather. The app is considered as the most accurate source of hyper local weather information. Down-to-the-minute forecasts enable you to know exactly when the rain will start or stop. The app has several different ways to notify you of important weather conditions. In addition, severe weather alerts allow you to known about the dangerous conditions such as flood, hurricane and thunderstorms etc. By using GPS, the app is able to create forecasts for your exact location, providing minute-by-minute predictions for the next hour and also hour-by-hour forecasts for the next day and week. This weather app offers latest weather news as well as other important information, including minute-by-minute precipitation forecasts for the next two hours hyper-localized to your exact street address as well as GPS location. On the other hand, when AccuWeather forecasts ice, wind, rain or snow, you will see an orange card with an exclamation point showcased within the current conditions of the location and with a summary of the alerts. In addition, the app gives push notifications for severe weather alerts in the United States and a radar for North America and Europe. There are some latest news and weather videos in both English and Spanish. The app includes a highly acclaimed design and some amazing photos that match your location, current weather conditions as well as time of the day. With this app, you can see animated sunrise, sunset, pressure modules and wind. You can also get details of chance of precipitation, wind and pressure. The app for both Android and iOS also includes an interactive radar, satellite and wind maps. It offers a Dynamic Home Screen that changes as per your current location, weather as well as the time of day. Hourly, 15-day and weekend forecasts are available in metric, imperial or hybrid units of measure. There are weather maps, allowing you to see road and satellite views, wind speeds, water temperature, wind speed and many more. Furthermore, current weather conditions provides you “feels like” weather, dew point, humidity UV index, visibility as well as barometric pressure. Severe weather alerts, rain reports for your favorite locations and rain alerts are sent through notifications. 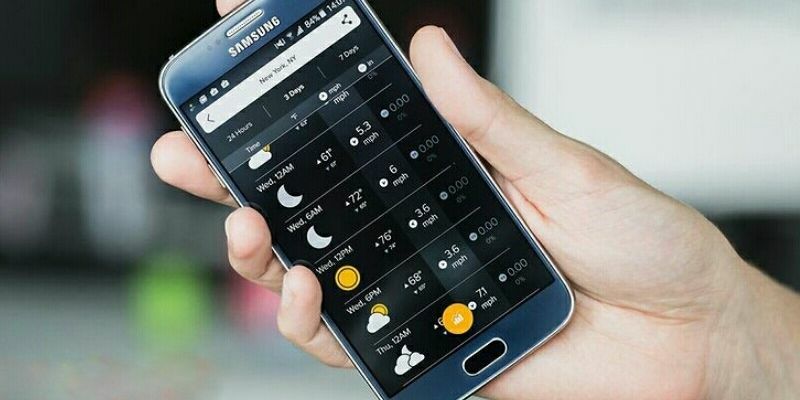 These are some of the best weather apps for Android and iOS, allowing to know check the weather in a hassle-free manner.